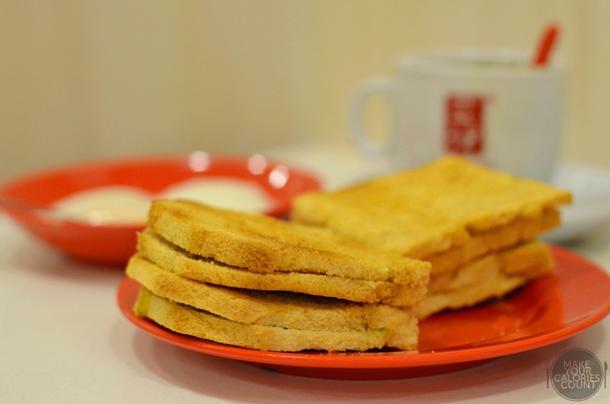 Following the write-up on Killiney Kopitiam, we were determined to find which kaya toast chain offered a better version of the kaya toast. Personally, I always felt that Ya Kun had a better corporate positioning locally and worldwide. Why you might ask and the answer is simple - even my foreigner friends know about Ya Kun or Toast Box and not many have heard of Killiney Kopitiam for some reason. 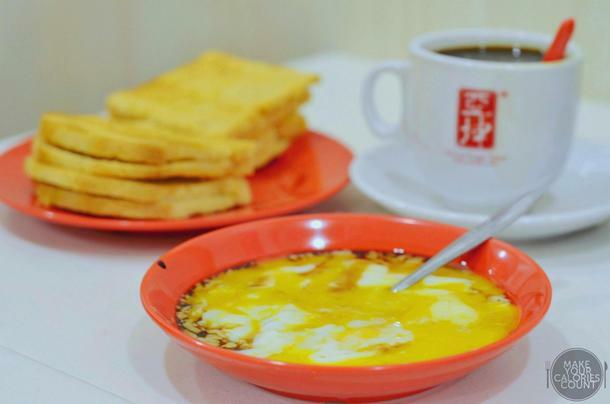 I did a food tasting on the leading kaya toast chains in Singapore when I first started this blog and our verdict then was that Killiney Kopitiam and Ya Kun were the two chains that won us over. We loved the story behind Ya Kun and you might be interested to read more about it here. 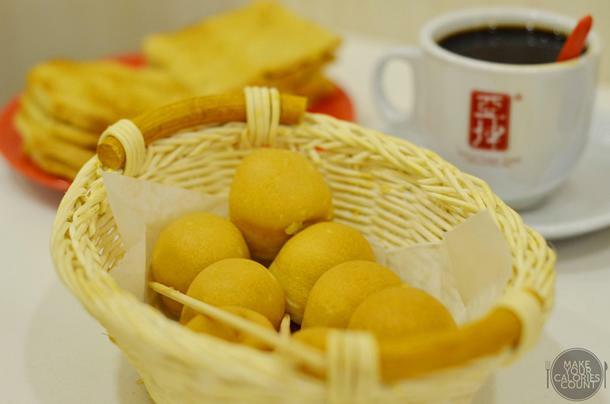 With a humble origin as a coffee stall since 1944, Ya Kun had developed into a brand that Singaporeans and foreigners alike are familiar with. With the founder's children running the business now, are current operations still fitting of the underlying tagline which reads 'The toast that binds...Kinship, Friendship, Partnership.' 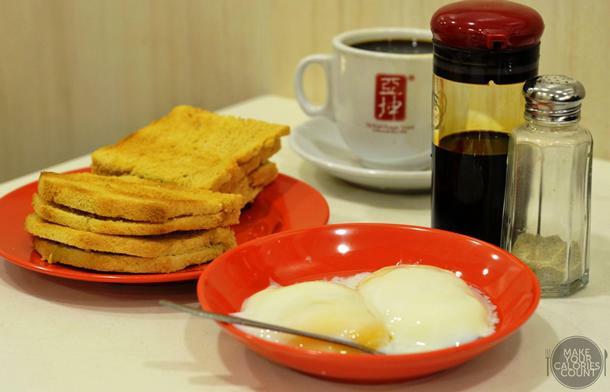 and is it a better kaya toast place than Killiney Kopitiam? Let us find out now! I was very impressed with the lady who served me and Ya Kun certainly lived up to their legacy of being 'The most courteous stall in Lau Pa Sat' award dating back to the 1980s. I had actually ordered the toasts and coffee initially but after payment, I saw the beautiful half-boiled eggs being served to customers and I decided to add on my order. The lady serving me unexpectedly told me that it would be more value for money if I got the toast set instead which comprised of the kaya toast, coffee and the half-boiled eggs which came at S$4.50 and she took the initiative to make amendments to my order (where a receipt had already been issued) and charged me the set price instead of a separate item on the menu. Yes, the 50 cents saved might not seem like a big deal but it is that attention and customer service that was truly commendable. Now, back to the food. 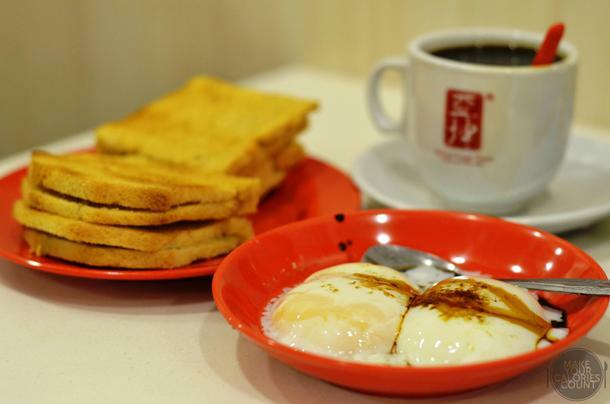 The brown toast served at Ya Kun was thinner than the ones from Killiney Kopitiam. We drew comparisons and it seemed like Ya Kun had their bread sliced in the middle but it made the toast a lot crispier and the crusty surface was a joy to crunch. The all important kaya was also smoother than that of Killiney Kopitiam's and a seemingly stronger pandan taste and fragrance but it lacked an eggy flavour. It was well-balanced in terms of sweetness level which was adjusted to the palate of majority and on this instance, suited ours. Our only complaint was that the wedge of butter was served slightly cold but that could be overlooked with their velvety smooth kaya. The half-boiled eggs were served with the shells-removed, exposing that large beautiful orange-coloured egg yolk that I hesitated no further in downing after adding the usual dark soy sauce and pepper seasoning. It was cooked perfectly, leaving a thin membrane on the outside containing that rich egg yolk. Simply brilliant. I am not going to delve into details about the kopi-o-kosong (plain black coffee) but it was a similar dark roast and bold in flavour with a good balance in acidity. Satisfies the uncle in me with that undying love to la kopi. This was a classic way of enjoying kaya, first introduced to me by my grandfather more than two decades ago when he was still a bubbly figure. 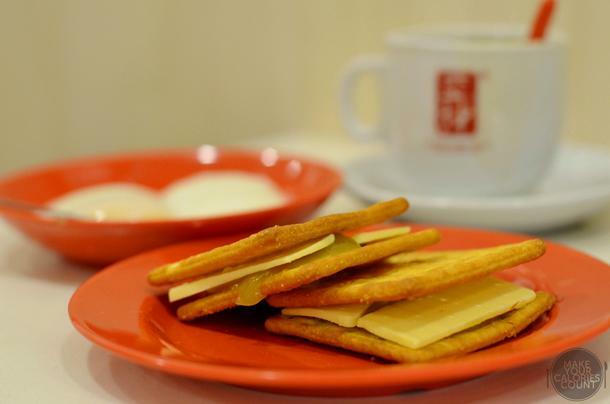 Crisp cream crackers with a generous amount of butter and kaya, there was really no way to resist this brilliant combination! Offered in 8s or 4s, with the latter at S$2, it seemed more value-for-money to go for 8 of these delectable kaya balls. It seemed like I was the only one who enjoyed it because none of my companions found it good for some reason. Perhaps I was trying to fix my craving for some kaya balls which resulted in my rather biased judgement but I could not think of anywhere else in Singapore to get them. My best bet would be Malaysia which is cheap and good. Nonetheless, the kaya in this was good and generous so if you popped one ball into your mouth like I did, expect it to explode with all the goodness of that coconut jam. The dough tasted soft and limp instead of the usual crisp version tried in Malaysia. 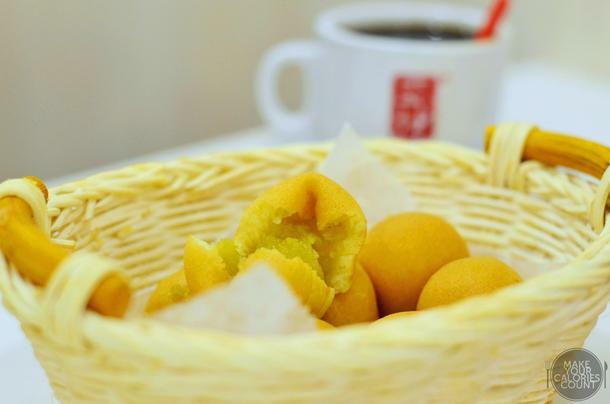 This is a new item on their menu and would be good if you are craving for one of these sinful treats. It is definitely not the best I had tried but surely a passable rendition. 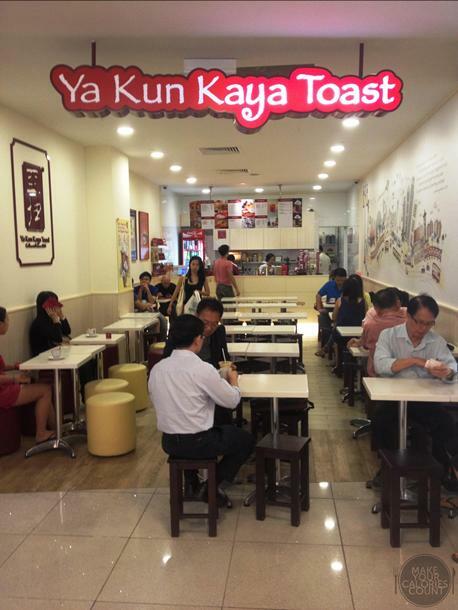 Having tried the kaya toasts from both Killiney Kopitiam and Ya Kun, I remain divided about which is the best kaya toast chain in Singapore for both kayas were different and appealing in their own ways. It is my humble opinion that these two chains serve the best kaya around in Singapore but I know of people who swear by other brands. Taste is of course a very subjective matter. What I can confidently say is that I received very dedicated and good customer service by the lady during my visit at this outlet at Vivocity.